So far, the Mass Effect: Invasion arc has been top notch. 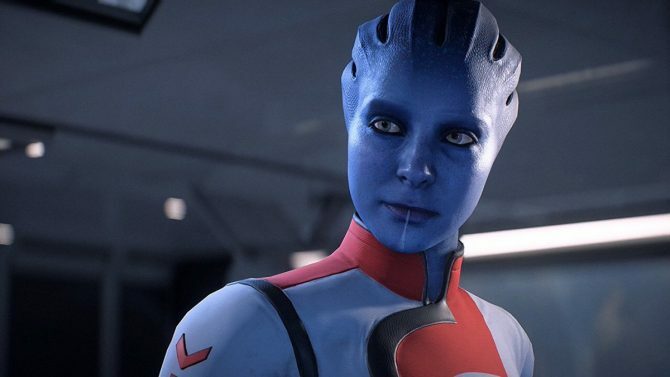 By not focusing on a major character, Mac Walters was really able to flesh out the Mass Effect universe a bit more. Aria has been a likeable protagonist, but she has an excellent foil in her honorable nemesis, General Petrovsky. While issue three was good, it was still a bridge issue. Issue 4 is the final issue of the arc, and it finishes the series off rather appropriately. 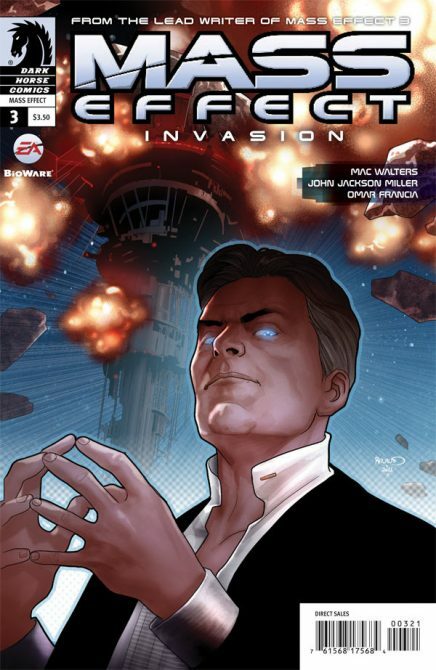 Mass Effect: Invasion doesn’t finish with quite the flourish that one would expect from a standard ending issue, but when you finish reading it, you realize that it finishes exactly as it should. If these were stand-alone issues, I would be concerned. But since these comics are part of a massive piece of cross-media IP, the finale actually fits very well. The ending of the comic is still exciting, but it seems that it cannot actually be more than it is, because it accomplishes what it set out to do. That is to say that while Invasion issue four effective closes the comic’s story out, it still leaves an ominous tone for what is to come when Mass Effect 3 comes out. What was so nice about this series is that it really sets up the third game in the series. 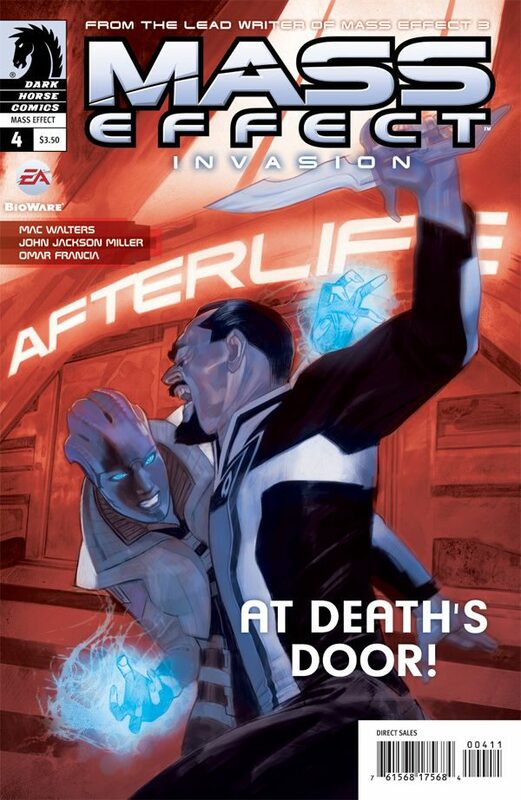 We know by now that the Reapers are coming, but in attacking Omega first, it really shows that they don’t care about factions or actual places, the Reapers, via their husks, just want to wipe out life in general. The selection of Omega was no accident. On the face, it suggests that the Collector’s base was much more than it seemed, however, when one looks under the surface, you can see that it is so much more than that. Omega is the anti-citadel, a place that is by all accounts neutral to every race in the galaxy (hence the diverse population within its confines). In having Omega come under attack, Walters has smartly shown us months before Mass Effect 3 that humanity and the friendly racers are not the only race at risk here. The Arrival DLC worked similarly, but it is really nice to see this perspective also shown through the comic book medium. As for the actual comic issue, the art once again stands out. Omar Francia has an awesome grasp by now of the unique designs for the technology in the universe. This makes the action sequences in the comic very enjoyable, as it almost seems like they could be cinematics from the games. Nothing, from the ship designs to the aliens, looks out of place. All of this adds up to the art fitting in nicely with the series’ universe. The best moment in the entire arc comes courtesy of the art as well. There is a sequence when Aria finally returns to Afterlife and it is distinctly unsettling. Over the course of Mass Effect 2, you visit the seat of Aria’s power, the nightclub Afterlife, several times. It is a place that is alive with people drinking, dancing and having fun. In the last issue of the comic, Aria returns to Afterlife, but it is dark and empty. It is one of darkest sequences in the comic, from a literal standpoint. The rest of the comic is vibrant and alive, but when Aria enters her club, it is muted and dark. Expanded upon, it could serve as a fitting metaphor for the atmosphere of Mass Effect 3, where even though the Reapers were still coming, life went on. These few panels seem to symbolize that life will come to a standstill as the Reapers invade. While it is the best moment, that whole feeling can be expanded to the entire last quarter of the last issue. There is a small sense of despair. Of course Aria responds to this as you would expect, but even she seems concerned for the bigger picture. The actual, story ending of the comic itself is also pretty dark and contains a nice twist, though I won’t dare spoil it here, but it did not end as I expected it to. Further, there are a lot of hints that the Illusive Man will be much worse than what we expected from the end of Mass Effect 2. The hints of this are not new, as many were present in Evolution, but they are still there. I wish I could comment further, but I will refrain from doing so to avoid possibly spoiling anything. 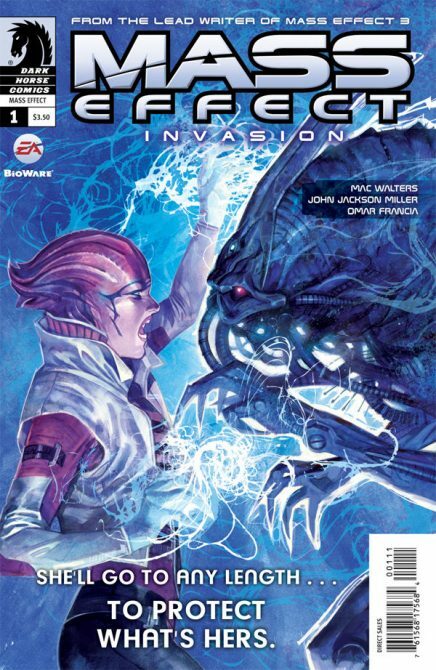 Walters has done an awesome job of converting these characters from their game environment to the world of comics, and if you are a fan of Mass Effect, there is really no reason to grab these comics to hype yourself up for Mass Effect 3. If nothing else, they will set a perfect tone to make the remaining wait for the game that much harder.